Some of the topics I discuss here include anime, consistency problems, and name changes. I cover bad English and fan translations in this post. In these posts we'll examine alcohol, censorship, death-related content, and more. Includes a look at bad English and bootlegs. I cover incorrect translations, references to stuff, and translation notes in this post. This post focuses on topics like fan translations, translation wars, and voice acting. I cover Japanese writing systems, the Japanese language, customs, and more in these posts. In this post I look at censorship and gender. This post features a look at censorship, food, and puns. I cover bad English and bootlegs in this post. This post focuses on topics like fan translations, translation notes, typos, and more. Some of the topics I discuss here include food, incorrect translations, pronunciation, and more. These posts focus on bad English. This post focuses on topics like bad English and bootlegs. Some of the topics I discuss here include bad English and untranslated text. I mainly cover game programming in this post. I mainly cover swearing in this post. This post covers the Japanese language, rhyming, and songs. I wrote some stuff here but I forget what topics specifically. In this post I look at bad English, grammar, and typos. In this post we'll examine censorship and insults. This post covers bad English and bootlegs. In these posts I look at fan translations, the German language, politics, and more. This post focuses on topics like censorship, graphics/graphical changes, and religious topics. Some of the topics I discuss here include fan translations, translation wars, and voice acting. Topics include censorship and sexual content. These posts cover fan translations, programming stuff, technical stuff, and more. Some of the topics I discuss here include catchphrases, English-to-Japanese translation, idioms, and more. This post covers pop-culture references, references to stuff, and secret content. These posts feature a look at censorship, consistency problems, death-related content, and more. In this post I look at incorrect translations, references to stuff, and translation notes. These posts focus on topics like censorship, consistency problems, death-related content, and more. I mainly cover gender in this post. Includes a look at incorrect translations, references to stuff, translation notes, and more. This post focuses on punched-up text. In this post we'll examine fan translations and incorrect translations. In this post we'll examine English-to-Japanese translation, gender, and speech styles. In this post I look at anime, consistency problems, gender, and more. Some of the topics I discuss here include bad English, fan translations, swearing, and more. I cover font-related stuff, Japanese writing systems, spelling Japanese words in English, and more in these posts. Some of the topics I discuss here include idioms, jokes, and puns. This post features a look at politeness levels, punched-up text, sexual content, and more. These posts feature a look at mythology, name changes, food, and more. Topics include fan translations, the German language, politics, and more. In this post I look at bad English, fan translations, swearing, and more. This post features a look at alcohol, anime, food, and more. This post covers fan translations, how Japan views America, and incorrect translations. I cover puns and references to stuff in this post. In this post I look at fan translations, translation wars, and voice acting. Includes a look at the Korean language, manga, marketing, and more. Some of the topics I discuss here include anime, sports, consistency problems, and more. Topics include font-related stuff, Japanese writing systems, and spelling Japanese words in English. I mainly cover songs in this post. In these posts we'll examine bad English, bootlegs, and swearing. This post covers fan translations, translation notes, typos, and more. Some of the topics I discuss here include fan translations, translation notes, typos, and more. This post features a look at bad English and bootlegs. Topics include food, memes, movies, and more. These posts feature a look at censorship, graphics/graphical changes, religious topics, and more. I cover anime, consistency problems, and name changes in this post. Includes a look at font-related stuff, Japanese writing systems, and spelling Japanese words in English. Some of the topics I discuss here include bad English, religious topics, and swearing. Includes a look at anime, pop-culture references, and references to stuff. These posts feature a look at anime, sports, mythology, and more. Includes a look at English-to-Japanese translation, gender, and speech styles. In this post I look at incorrect translations, references to stuff, and religious topics. Topics include fan translations, translation wars, and voice acting. I cover food, memes, movies, and more in this post. I cover fan translations, translation wars, and voice acting in this post. In this post we'll examine censorship and fat-related topics. I cover censorship, graphics/graphical changes, religious topics, and more in these posts. In this post I look at censorship, consistency problems, death-related content, and more. These posts cover censorship, graphics/graphical changes, religious topics, and more. I cover censorship, consistency problems, death-related content, and more in these posts. I cover English-to-Japanese translation, gender, speech styles, and more in these posts. These posts focus on topics like alcohol, censorship, death-related content, and more. Some of the topics I discuss here include alcohol, anime, food, and more. Topics include alcohol, anime, food, and more. These posts cover fan translations, bad English, religious topics, and more. These posts focus on topics like food, memes, movies, and more. These posts cover mythology, name changes, censorship, and more. Includes a look at mythology, name changes, alcohol, and more. Includes a look at bad English and references to stuff. These posts focus on topics like fan translations, music, pop-culture references, and more. I cover censorship, consistency problems, death-related content, and more in this post. I cover fan translations, bad English, swearing, and more in these posts. Topics include alcohol, censorship, death-related content, and more. This post covers food, incorrect translations, pronunciation, and more. I cover marketing and references to stuff in this post. I cover food, incorrect translations, pronunciation, and more in this post. Topics include food, incorrect translations, pronunciation, and more. Includes a look at bad English, bootlegs, grammar, and more. In these posts we'll examine bad English, bootlegs, fan translations, and more. This post features a look at bad English and fan translations. I mainly cover fan translations in this post. Includes a look at anime, consistency problems, gender, and more. Includes a look at bad English, comedy, historical stuff, and more. In these posts I look at font-related stuff, Japanese writing systems, spelling Japanese words in English, and more. In this post we'll examine dialects and English-to-Japanese translation. These posts cover fan translations, translation wars, voice acting, and more. In this post I look at bad English and non-native English speakers. These posts focus on topics like food, incorrect translations, pronunciation, and more. In this post I look at anime, English-to-Japanese translation, manga, and more. Topics include bad English, bootlegs, typos, and more. I cover food, incorrect translations, pronunciation, and more in these posts. In this post I look at English-to-Japanese translation, gender, and speech styles. I mainly cover bad English in this post. In these posts I look at fan translations, translation wars, voice acting, and more. Includes a look at incorrect translations, religious topics, and spelling Japanese words in English. This post focuses on bad English. This post focuses on name changes. These posts cover bad English, grammar, the Japanese language, and more. This post covers anime, pop-culture references, and references to stuff. Topics include sexual content and wordplay. I cover anime, pop-culture references, and references to stuff in this post. I cover fan translations, translation notes, typos, and more in this post. This post focuses on fan translations. I cover alcohol, censorship, death-related content, and more in these posts. In this post I look at font-related stuff, Japanese writing systems, and spelling Japanese words in English. This post focuses on swearing. In these posts we'll examine food, memes, movies, and more. Some of the topics I discuss here include anime, consistency problems, gender, and more. In these posts I look at jokes, puns, and name changes. This post focuses on marketing. This post covers anime and sports. These posts focus on topics like comedy, dialects, rhyming, and more. This post focuses on topics like bad English, fan translations, swearing, and more. I cover name changes and typos in this post. I mainly cover name changes in these posts. Topics include bad English, fan translations, swearing, and more. In this post we'll examine food, incorrect translations, pronunciation, and more. Topics include accents, Japanese game ratings, comedy, and more. I mainly cover wordplay in this post. I cover Japanese writing systems and wordplay in this post. Includes a look at gender and incorrect translations. This post focuses on differences of opinion. This post features a look at fan translations and untranslated text. In this post we'll examine bad English and religious topics. Some of the topics I discuss here include alcohol, censorship, food, and more. This post covers alcohol, anime, food, and more. I cover name changes and palindromes in this post. Includes a look at basketball, sports, alcohol, and more. I cover mythology, name changes, alcohol, and more in these posts. This post features a look at food, incorrect translations, pronunciation, and more. This post covers basketball, name changes, parodies, and more. Some of the topics I discuss here include programming stuff and technical stuff. Some of the topics I discuss here include fan translations, programming stuff, and technical stuff. This post focuses on ninjas. I cover anime, consistency problems, name changes, and more in these posts. I cover anime, consistency problems, gender, and more in this post. Includes a look at food, incorrect translations, pronunciation, and more. Topics include anime, consistency problems, and name changes. Some of the topics I discuss here include bad English and religious topics. In these posts we'll examine anime, consistency problems, name changes, and more. I cover cats and Japanese writing systems in this post. These posts focus on topics like music, name changes, sports, and more. Includes a look at fan translations and untranslated text. I cover comedy and jokes in this post. I mainly cover bad English in these posts. These posts cover font-related stuff, Japanese writing systems, spelling Japanese words in English, and more. This post focuses on topics like font-related stuff, Japanese writing systems, and spelling Japanese words in English. This post focuses on politeness levels. This post focuses on topics like food, memes, movies, and more. In this post I look at Japanese writing systems and typos. I cover fan translations, food, memes, and more in these posts. This post features a look at anime, English-to-Japanese translation, manga, and more. Topics include dialects and literal translations. This post focuses on topics like anime, consistency problems, and name changes. This post features a look at rumors and sexual content. This post focuses on sexual content. This post focuses on topics like anime and references to stuff. Topics include font-related stuff, Japanese writing systems, spelling Japanese words in English, and more. I cover censorship, gender, catchphrases, and more in these posts. I cover anime, English-to-Japanese translation, manga, and more in these posts. These posts focus on topics like bad English and fan translations. This post covers puns and references to stuff. I cover comedy, jokes, and puns in this post. In this post I look at literal translations and speech styles. I cover translations that surpass their source text and sound effect words in this post. Topics include bad English and bootlegs. Topics include the Korean language, manga, marketing, and more. I cover fan translations and parodies in this post. Includes a look at anime, English-to-Japanese translation, manga, and more. Some of the topics I discuss here include bad English and bootlegs. I cover bad English, fan translations, references to stuff, and more in these posts. This post focuses on topics like basketball and sports. I mainly cover insults in this post. This post focuses on topics like alcohol, anime, food, and more. I cover alcohol, anime, food, and more in this post. Includes a look at new content that was added in and swearing. In this post we'll examine anime, pop-culture references, and references to stuff. In this post we'll examine fan translations, translation wars, and voice acting. In this post we'll examine bad English and machine translation. Topics include spelling Japanese words in English and secret content. I mainly cover name changes in this post. Some of the topics I discuss here include catchphrases, jokes, and puns. This post focuses on game programming. I cover font-related stuff, Japanese writing systems, and spelling Japanese words in English in this post. In this post we'll examine font-related stuff, Japanese writing systems, and spelling Japanese words in English. I cover basketball, sports, Japanese writing systems, and more in these posts. This post focuses on topics like memes, pop-culture references, and references to stuff. These posts feature a look at game programming, translation notes, unused content, and more. In this post I look at censorship, graphics/graphical changes, and religious topics. This post features a look at basketball, name changes, parodies, and more. This post features a look at fan translations, programming stuff, and technical stuff. These posts feature a look at mythology, name changes, anime, and more. This post features a look at alcohol, censorship, death-related content, and more. These posts focus on topics like name changes and untranslated text. Includes a look at font-related stuff, Japanese writing systems, spelling Japanese words in English, and more. I cover anime, manga, music, and more in these posts. Topics include anime, consistency problems, name changes, and more. I mainly cover incorrect translations in these posts. In these posts I look at gender and pronouns. I cover anime and sports in this post. Topics include differences of opinion, name changes, mythology, and more. In these posts I look at English-to-Japanese translation, gender, speech styles, and more. In these posts I look at anime, bad English, pronunciation, and more. This post focuses on untranslated text. Includes a look at fan translations, food, jokes, and more. Some of the topics I discuss here include grammar and incorrect translations. In this post I look at anime and sports. I mainly cover typos in these posts. In this post we'll examine the Japanese language and incorrect translations. Some of the topics I discuss here include accents and dialects. In this post I look at food, incorrect translations, pronunciation, and more. I cover fan translations, how Japan views America, and incorrect translations in this post. I cover alcohol, censorship, consistency problems, and more in these posts. In this post we'll examine alcohol, censorship, death-related content, and more. 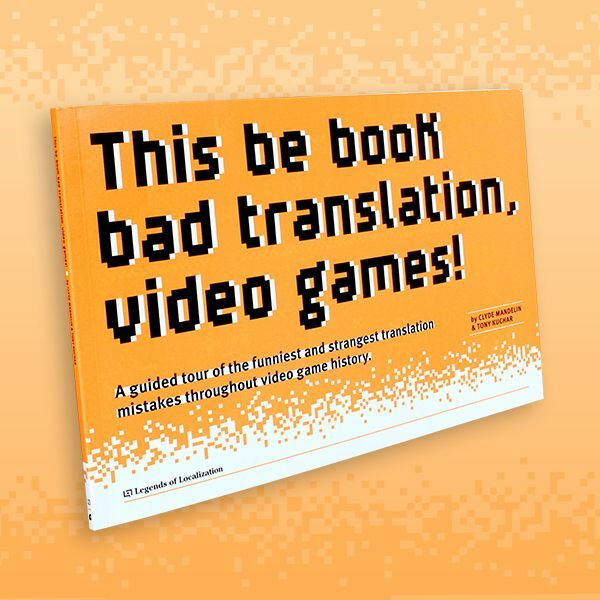 Includes a look at bad English, fan translations, swearing, and more. This post focuses on speech styles. These posts focus on topics like censorship, graphics/graphical changes, religious topics, and more. These posts cover censorship, fat-related topics, Japanese writing systems, and more. These posts focus on topics like font-related stuff, Japanese writing systems, spelling Japanese words in English, and more. I mainly cover swearing in these posts. Includes a look at fan translations, the German language, politics, and more. These posts feature a look at font-related stuff, Japanese writing systems, spelling Japanese words in English, and more. These posts cover food, memes, movies, and more. I cover bad English and religious topics in this post. I mainly cover untranslated text in this post. Includes a look at movies and pop-culture references. This post features a look at censorship and fat-related topics. In these posts I look at bad English, spelling Japanese words in English, typos, and more. I cover censorship, graphics/graphical changes, and religious topics in this post. This post covers anime, consistency problems, gender, and more. Some of the topics I discuss here include font-related stuff, Japanese writing systems, spelling Japanese words in English, and more. Topics include secret content and voice acting. This post focuses on topics like bad English and non-native English speakers. Includes a look at culture stuff, historical stuff, and songs. I mainly cover folklore in this post. Includes a look at censorship, consistency problems, death-related content, and more. I cover bad English, fan translations, swearing, and more in this post. Some of the topics I discuss here include drug-related content, graphics/graphical changes, and ninjas. In this post we'll examine historical stuff, pop-culture references, and references to stuff. These posts cover anime, sports, and Japanese writing systems. This post focuses on Japanese writing systems. Some of the topics I discuss here include bad English, fan translations, references to stuff, and more. I cover bad English, culture stuff, fan translations, and more in these posts. This post covers dialects, fan translations, food, and more. In this post I look at fan translations, the German language, politics, and more. I cover non-native English speakers and spelling Japanese words in English in this post. This post features a look at bad English and religious topics. Some of the topics I discuss here include incorrect translations, font-related stuff, Japanese writing systems, and more.